Vanilla uses numerous spacing variables across the codebase in order to ensure consistency in spacing between components, and to ensure typographic elements sit on the baseline grid. 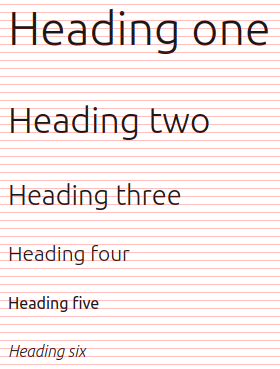 Vanilla uses a default spacing unit of .5rem (8px) as a basis to calculate spacing inside and between components, as well as the line-heights of the different type sizes. The image shows the headings sitting on the baseline grid, where the space between each line is one $sp-unit. The $spv-intra variables are used to determine vertical spacing inside components, while $spv-inter variables are used for spacing between components. The following vertical spacing variables are used between a group of components and its wrapper, for example in strips. The $sph-intra variables are used to determine horizontal spacing inside components, while $sph-inter variables are used for spacing between components. There are also generic spacing units for backwards compatibility with components created with Vanilla before v1.7.0.